Loft 29 is an unique artist loft available for events and production rentals. 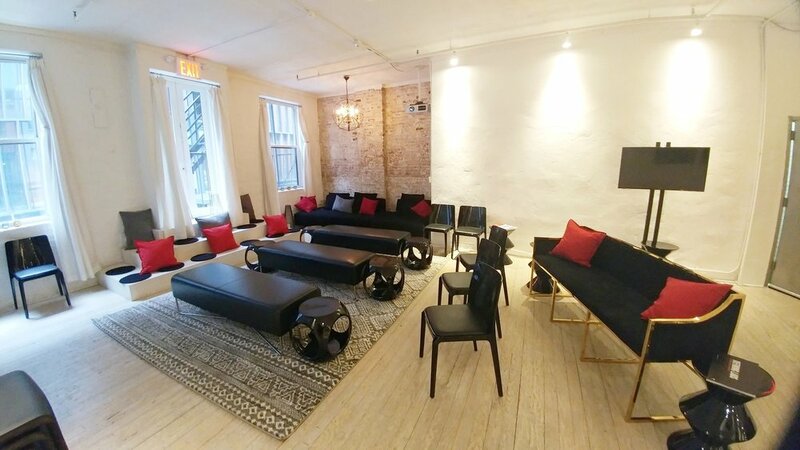 Located in Chelsea, this venue is a very popular and edgy option for intimate NYC weddings and other family events as well. Large white brick wall, exposed brick wall, clean white wall, concrete with natural stone designed full kitchen & bathroom, white stained oak wood accent wall, 100+ year old metal doors, fire escape, and white stained flooring. Kitchen includes a unique floating concrete bar. 2 custom designed oak wood benches. Private room available for hair/makeup & styling changes and as a back-of -house area. Large windows which provide beautiful natural light in the day. Custom designed light sconces and track lighting offer a chic ambiance in the evening. Full A/V with Stationary HD Projector with 100 inch drop screen available on-site.